Performance coaching is different from executive or personal coaching in its focus on specifically improving performance by direct action. After using Thinking Styles, Julie Crane, a potential Olympic high jumper for the 2008 Olympics, not only jumped a personal best, but she achieved it under the stress of competition conditions. 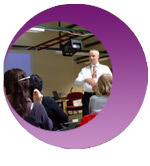 A County Council used Thinking Styles within its leadership development programme to help their leaders understand more about their individual strengths and weaknesses, to accept how the thinking style preferences of themselves and their colleagues affected their working relationships and to develop excellence in their quality of thinking. “Thinking Styles: a personal story"
This is one man’s personal journey towards turning his dreams into reality helped by Thinking Styles. Using Cognitive Team Roles helped a newly formed team within the public sector to understand its strengths and weaknesses. The team identified the need to recruit an additional member of the team, ensuring that they had the thinking style preferences he other team members lacked. The principle of cognitive pairing underpins this successful mentoring programme. Matching similarities and differences in the thinking styles of the participants leads to successful mentoring relationships and lasting empathy through shared values. 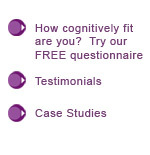 Identifying peoples’ thinking style preferences using Think Smart was the major factor in the programme’s success.